In the last portion of your letter you write to say, "I need to have this back immediately for publication in the upcoming issue of BTG." So I can advise you that you can publish it as it is, and if there is any discrepancy we will rectify it in future. The policy of the BTG should be always writing articles which can be understood by people in general. Vedic literatures like Brahma Samhita may be published in separate books, but assimilated ideas may be published in BTG. Please accept my humble obeisances. I am in due receipt of your letter dated 8th April, 1970, which was addressed to my New York office. I am so sorry to learn that there is a sort of conspiracy by some of our God-brothers as not to give me a place at Mayapur. I do not wish to argue on this point, but according to your advice I have already sent a telegram to Acyutananda Brahmacari and an urgent letter also requesting him to purchase the land of Jabed Ali almost a fortnight ago, but I have received no reply til now. So I do not know what to do in this connection. The money is there, the sanction is there, the land is there, and still if it does not take place, I shall understand it that this is not the desire of Srila Prabhupada. In the meantime, I have also advised my previous son, Sri M.M. De, to see you in this connection, and if possible to purchase the land in his name for the time being. So if he sees you, then please help him in purchasing the land. I am sorry that you wrote me several letters before in English, but they did not reach me due to postal strike. Now I have made my World Headquarters at the above address in our own building which we have purchased very recently at a cost of 20 lakhs of rupees. So in future you can address me at the above destination. Please accept my blessings. I am in due receipt of your letter dated the 6th instant, and noted the contents. In my last letter I advised you that your Devanagari Lipi class should begin by chanting Hare Krsna Mantra, but if you find the time is short, then instead of reciting the Guru mantra quoted by you which is of impersonal mature, you can chant the following verse which we do along with others. The verse quoted by you is not approved by us. Regarding your inquiry about Aurobindo, I may inform you that Aurobindo does not belong to the Bhakti school. He is more or less a dry philosopher, mental speculator, with some mystic ideas. We are simply concerned with pure devotees, so we have nothing to learn from Aurobindo. One practical estimation of Aurobindo, I know that one of the important disciples of Aurobindo, Dilip Roy, tried his best to induce one English devotee, Professor Nixon, later on Krsnaprem, to become a disciple of Aurobindo, but Krsnaprem never agreed to this. On the contrary, Dilip Roy later on became influenced by Krsnaprem and he left Aurobindo asram and is now chanting Hare Krsna Mantra at Poona. So you can judge yourself what is my estimation of Aurobindo. Please accept my blessings. I am in due receipt of your letter dated 9th May, 1970. Regarding the dummy BTG, I compared with the Japanese BTG, and it appears that the present one is quite inferior. The price is higher and the subscription card is not to be included, and the size is smaller also. So considering all these points it is inferior to the Japanese BTG. Now because there is no alternative we must get them printed here, but as you are going to Japan, I think you will be able to find out some printer who will be regularly supplying. You have asked me to send you a check for $4,500, but this is for the first time you have asked me to pay on account of BTG, and this point I have already explained to Gargamuni. So far I understand from Gargamuni that you misunderstood me that I want to take the management of BTG I never meant like that, neither I have got any time to tax my brain in that way. So you shall continue the management of BTG, and ISKCON Press is meant for that purpose. Formerly when it was in the hand of Rayarama he was managing separately, then it came to your hand and the management is going on, but you never asked me for any payment in the matter of BTG. So I have asked Gargamuni to send you back the check which I understand you sent to him on this account for $5000. So I am simply interested in the book distribution, and whatever collection is made in this department may be paid to me either by you or by Gargamuni; and when there is question of printing books certainly I shall pay as I have been doing--that will simplify the matter. When you come here I will talk with you further on this matter, but what I want is that I may not tax my brain in the management of many departments. Please accept my blessings. I have not heard from you in some time. I hope you are doing well. I am anxious to know what happened to the other two pairs of Deities. These two pairs of Deities are immediately required for Paris and Berlin. So I will be very much pleased if you dispatch them immediately to Scindia Steam Navigation Co. as you did last time. Kindly treat this as urgent, and let me know what is the situation. Please accept my blessings. I am in due receipt of your letter dated by Post 5th May, 1970. So it is very encouraging that people are coming to the extent of 40 heads, and they are trying to understand the importance of this great movement, and any sane man will be able to understand that. But I do not know why our students who are supposed to be the leaders of this movement will fight amongst themselves for supremacy. Our whole process is of surrendering. We are taught to address others as Prabhu. 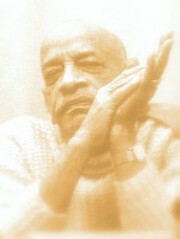 Prabhu means master; and the leader of the masters is called Prabhupada. So if the Prabhus have surrendered to the Prabhupada, why there shall be such mentality of occupying the superior position? This is contradictory. Kindly stop this unnecessary misunderstanding. Both Upendra and yourself are competent and experienced, so please adjust your disagreement amongst your selves. It is my request. As a matter of fact, as you are the pioneer in taking all risks to go to Australia, naturally you shall be considered as the leader, but a leader's position is also very grave and responsible. A leader has to lead others very tactfully and intelligently. Kindly therefore do not quarrel, but go on with your duties progressively. I can understand very well that Upendra is feeling very much disturbed on account of Citralekha's absence, it is quite natural, but what can I do? I have arranged for $500 also, but the Australian Immigration detained her for a technical reason. This is already informed in detail to Upendra by Madhudvisa, as I understand. So this is the position. In the meantime, things should run on as it is, and if there is any need of change, we shall consider about it when Citralekha goes there. Please try to organize the new center as nicely as possible even at personal inconvenience--that is real service. Krsna is sitting in everyone's heart, He knows everything what to do, so depend on Him and do your duties patiently. Maya is very strong, and we are liable to fall down at any moment. We have to gather our strength by chanting the beads sixteen rounds regularly and praying to the lotus feet of Krsna for guidance. I hope both of you will kindly follow my instruction and forget if there is any accidental disagreement. Please accept my blessings. I beg to acknowledge receipt of your letter dated 4th May, 1970, along with a nice tape of Sankirtana and solo song. So it is very nice. Lord Caitanya has introduced a very nice system of self-realization through arts and songs. Both of you are expert in singing and musical science as well as painting work. Now by the grace of Krsna your talents are being utilized in His service. That is what we require in Krsna Consciousness. We do not require to qualify very extraordinarily to serve Krsna. Krsna is Self-sufficient, He does not require anyone's service, but still the more we render service unto Him the more we become happy. The example is given in the Srimad-Bhagavatam that the decoration on the face of a certain person is not seen by him, but when he sees his face on the mirror he enjoys. In other words, whatever we offer to the Lord, it is actually enjoyed by us. Just like we prepare so many delicious foodstuffs for Krsna, but we eat the Prasadam remnant of foodstuff offered to Krsna. The whole idea is that everything should be offered to Krsna, and afterward we shall enjoy the effects. You have painted so many pictures of Krsna, and when you see to the pictures you enjoy and at the same time Krsna is pleased. Similarly the foodstuff prepared for Krsna actually we partake for it, but at the same time Krsna is pleased. Those who are cooking for themselves and eating them without offering to Krsna cannot enjoy such blissful life like the devotees. By serving Krsna we are not the least loser, but we are simply gainer more and more transcendentally. Keep this point always in front, and work for Krsna and be happy. I have received some laddus from Boston without any note, but I think it is sent by Rukmini devi, so please offer her my thanks and blessings. Be happy and chant Hare Krsna. Hope this will meet you in good health. Please accept my blessings. I hope by this time you have received my letter dated 6th May, 1970, along with papers, tapes, etc. I have received one letter from Balmukund Parikh, the copy of which is enclosed herewith. It is understood that he is introducing something new in the name of teaching Devanagari script. The prayer of the Spiritual Master as he has quoted has no use for us, it is completely impersonal. This prayer immediately must be stopped. Another thing is he asked me about Aurobindo's estimation. This means that he gradually wants to introduce Aurobindo philosophy. All these things do not sound very nice. Please let me know what is the necessity of learning Devanagari script. We are transliterating all our books--Srimad-Bhagavatam, Bhagavad-gita, Brahma Samhita, etc.--in Roman type, So why you should waste your time in learning Devanagari script? So I am very much anxious to know what is the actual situation because I can sense that Mr. Parikh wants to introduce something in my absence which is completely against Krsna Consciousness. I hope you will understand me right and reply this letter by return mail what is the actual situation. Please accept my blessings. I beg to acknowledge receipt of your letter dated 24th April, 1970, along with the typical examples of hardbound editions of Sri Isopanisad, and thank you so much for them. This binding work is so nicely made. You have done it very well, and I am completely satisfied. I very much appreciate your efforts in our ISKCON bindery, and if such binding is done we will have sure success with our books. So you can bind our books in this way, and although it may go slowly just now it is being done very nicely. Then in future you may be able to do our binding here instead of in Japan. You write to say that these are some nice typical examples of your binding work, so it is a great credit because these books any man would be proud to have. I beg to thank you once again for your kind appreciations and excellent work. Hope this will meet you in good health. Please accept my blessings. I beg to acknowledge receipt of Krsna tape transcriptions #13, 32, and 33, and 34, along with your note from the art department. Regarding the Vedas personified, they should be drawn just like you have seen some pictures of great sages. They are young in appearance like perfect Vaisnavas, and they may be shown with tilak and Vaisnava markings in that way. So such pictures are definitely required and please have them execute the subjects appropriately as they have so nicely done thus far. In the meantime, I hope you have by now received my last letter inviting you to visit L.A. Temple at your earliest convenience, and I shall be very glad to see you then. Please accept my blessings. I hope everything is progressing well with you in Paris. I am enclosing herewith the copies of two letters which will speak for themselves. Please immediately let me know what is the actual situation regarding this matter. Please accept my blessings. I beg to acknowledge receipt of your letter dated 3rd May, 1970. Regarding the check which you have sent, Gargamuni says that he has not yet received it. I am so pleased to see how you are carrying our Sankirtana program amidst the demonstrations of the people. This newspaper clipping which you have sent is just portraying the point of our business, and I have made xeroxes and am distributing them to various parties as example of our work. This Sankirtana Movement of Lord Caitanya is most practical and authorized, so such incidents are to be expected, but this is a great credit for our propaganda efforts. I have already dispatched to you by separate mail an invitation to visit our L.A. center and meet personally with me at that time. So I am expecting to meet with you when you can come at your convenience, and then we can discuss such questions as you have asked as well as any others you may have. Please offer my blessings to your good wife Krsna Bhamini and your son Vaisnava das and all the other Prabhus there.